Several months ago, I was asked to create a head and neck portrait of this beautiful cat to be given as an early Christmas present to my client's sister. Like always, when I work on my commissions, I take progression photos which I send to the client for review and feedback. This not only gives the client an opportunity to provide input but also allows them to view the creation process as the subject slowly but surely comes to life in front of their eyes. On occasion, the client may change their mind about a particular aspect (such as a collar or tag for example) and as long as the work is not so far advanced and impossible to change, I am able to fulfill the request. So, I thought that it would be nice to share the step by step process of how this kitty came to life on paper. Unfortunately, I had to work rather quickly because of the Christmas rush and so I did not take as many progress shots as I usually do. This first image is a high resolution scan of the actual completed artwork. I manually adjust for color, tone and value using Photoshop and then add a watermark for id purposes. I try to match the original as close as possible but there is always some slight variation due to individual monitor settings and light conditions. The following images were taken under my work lamp using my cell phone. I don't scan the art as I'm working on it as this is mostly unnecessary and takes up valuable work time. 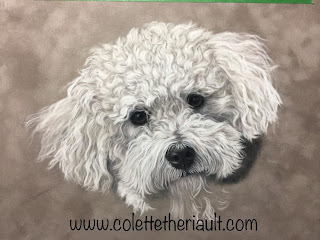 On occasion, I might scan the art when it is further advanced; for example, if the client needs to compare eye or coat color to the actual subject so that it is portrayed as accurately as possible. Last spring, I was invited by Artists on Elgin to submit artwork for consideration to be part of a six month long exhibit at the Legislative Assembly of Ontario "In Camera" dinning room. 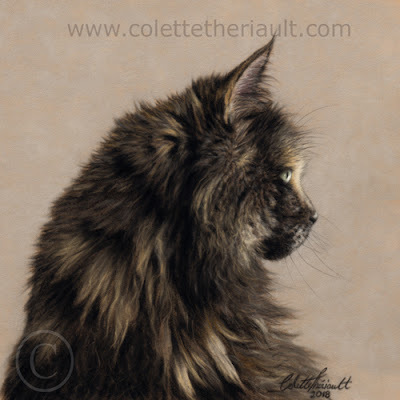 My piece "Contemplation" was accepted along with nine other works from local northern artists. 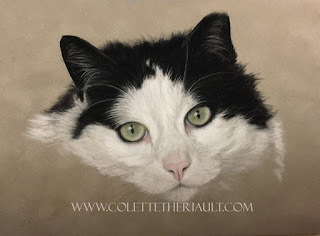 As the exhibit was rolling to an end in December 2018, I was contacted by a private client who expressed interest in purchasing the feline drawing. 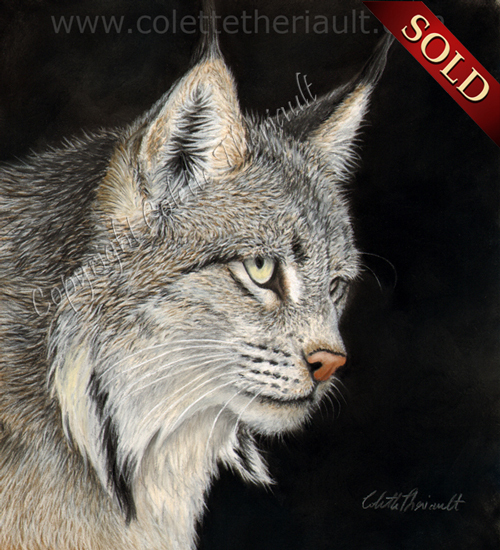 What a pleasant surprise when I learned today that the sale was finalized and my artwork has found its forever home! So much news...where to start? I guess I should begin with the fact that I'm greatly honored to be the recipient of the Artists for Conservation Foundation's monthly conservation award for November 2018. 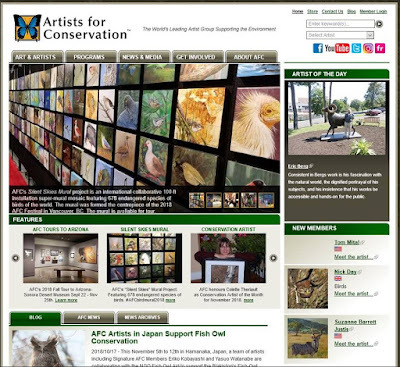 The AFC's Conservation Artist Award is awarded monthly to honour an AFC member for their outstanding artistic talent and extraordinary contribution to the conservation cause. At the end of each year, a past recipient of the monthly honour then has the opportunity to be considered for the annual Simon Combes Conservation Award. More news to come in this week's posts so stay tuned! I was asked to create a memorial portrait of my client's beloved Dexter as a special present for their. daughter. I am told she had a special bond with him and they would love to surprise her with a professional portrait of him. Dexter had a goofy and lovable personality which prompted the family to get a second Dalmatian; both are very special! Sometimes, when a dog has passed on, it can be a challenge to find good quality photos to work from. 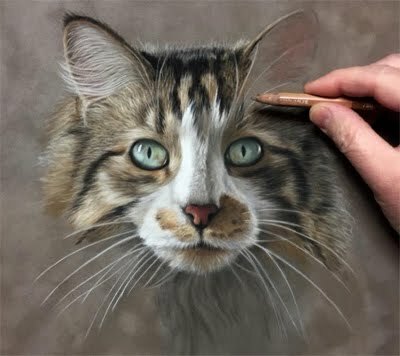 As professional artists, it is our job to render our subjects as accurately as possible so on occasion, we must use additional reference images to guide us with the details. In this instance, the photo that was to be used for the pose was not very good for several reasons. Firstly, the dog was photographed using a flash which leads to the white fur being over exposed and also resulting in glowing eyes. Important detail is lost and the subject looks flat because of lack of shadows. The second issue with the reference photo is that it is not in focus, so again, important detail is lost. Lastly, the photo was taken too far away so one has to crop the image to show only the head/shoulders which increases digital pixelation and further reducing detail. I really prefer suitable photos as it makes my job so much easier but alas, not all is lost, and here's the proof! 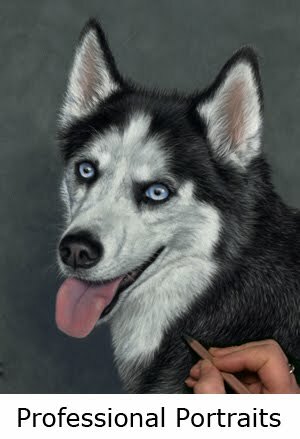 The client is very happy with the results of their portrait! 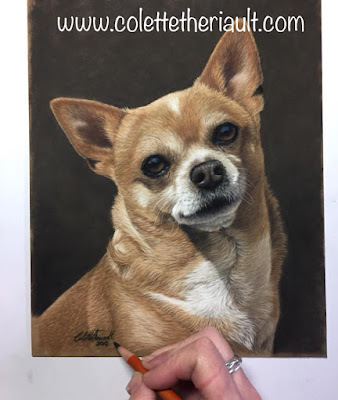 When I was asked to create this portrait to commemorate Brembo the Mexican Chihuahua, it was easy to choose which photo I was to work from. Although the eyes looked darker and the background was busy, everything else about the pose was simply just perfect! You can see the progression of this portrait on my FB page Animal Artistry Portraits and I am hoping to create a video as well and post to my YouTube channel in the not too distant future. 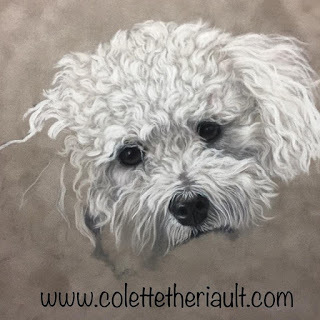 In the meantime, I have many personal projects I want to work on but have been getting a steady stream of clients so the paying work has to come first. I enjoy every bit of it and would not want to be doing anything other than painting and drawing except perhaps spending time playing in the gardens. Summer is so short, we have to take advantage of the warm sunny days when they occur. Stay warm and don't forget to take some time to smell the roses! 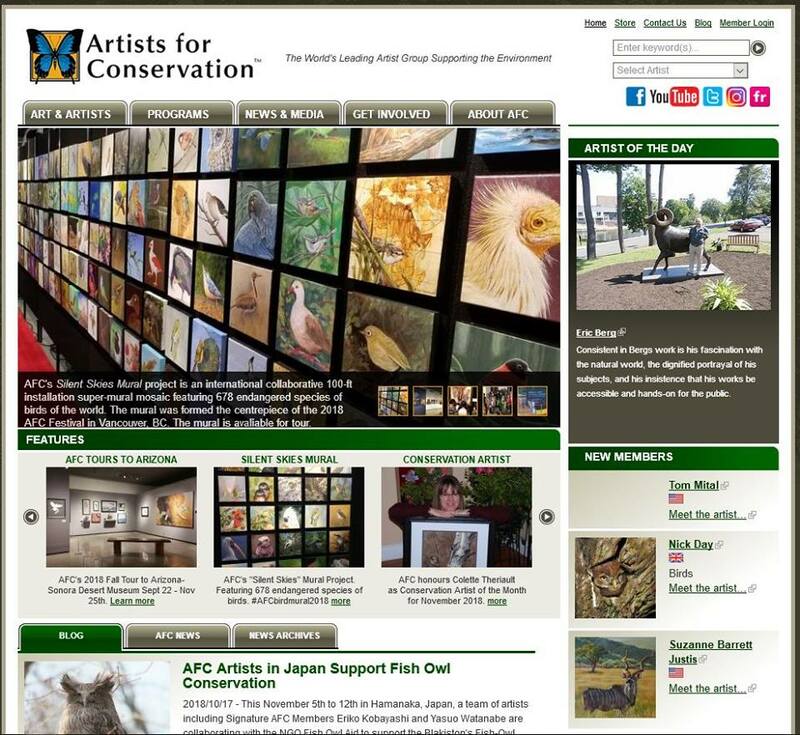 I'm SO THRILLED to announce that my work has been chosen to be part of the prestigious Artists for Conservation Nature in Art International exhibit, taking place in Vancouver, BC at the end of August 2018!!!!! My drawing "Curlicue" which was part of my Drawn to Nature solo exhibit last April will be shipped to BC for the Festival, with a possibility of an international tour (China, USA, Canada)!!!! 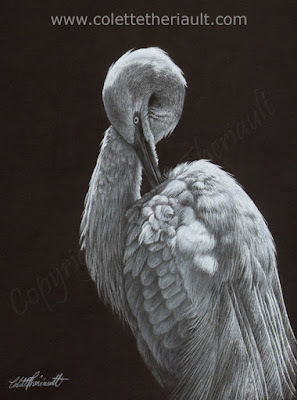 This is also in conjunction with the International Ornithological Congress...I have 2 special avian artwork pieces that will be part of a giant mural featuring the world's endangered bird species. 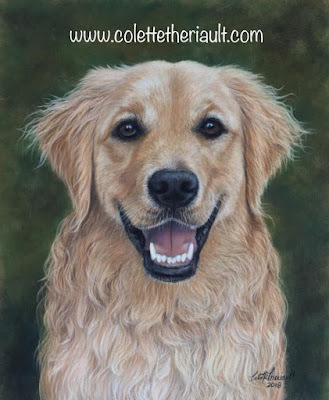 I was asked to create this portrait of a handsome golden retriever named Chester for Father's Day. 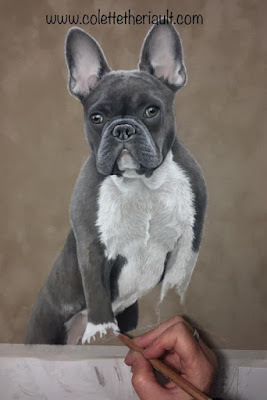 I had an older photo of the dog in his younger years, laying on the grass and so the client chose to use that one (along with a few modifications to the chest) for the pose. 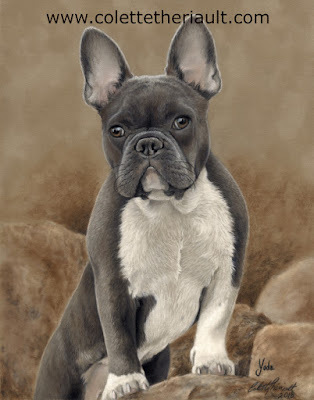 As the dog aged, his colors intensified and so that too was adjusted on the portrait (the chest was white and his face quite pale) with redder tones. It was such a joy to render this happy rendition of a most cherished family pet. What a beautiful memory to h ave Chester smiling back at you with his gentle eyes. 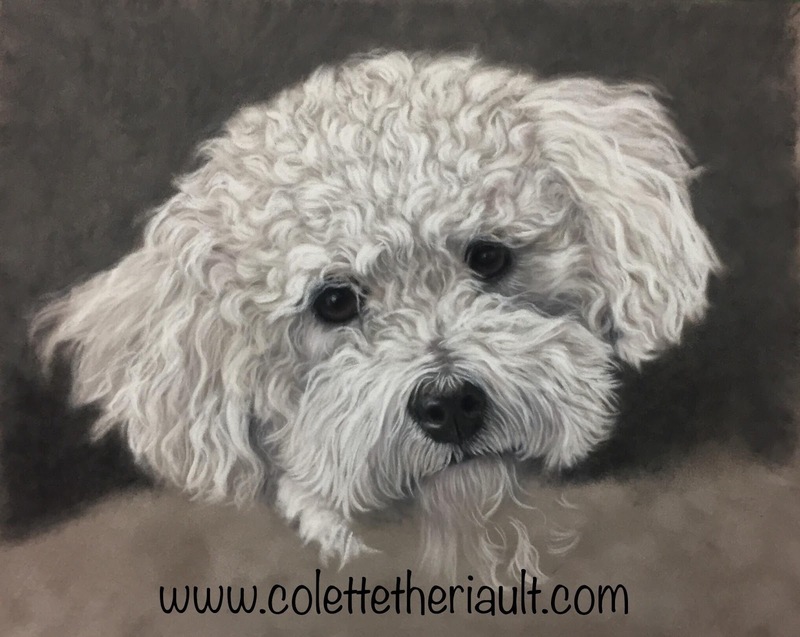 For more examples of my work, to order your very own pet portrait or to follow my artistic journey, hop on to my website or FB page. 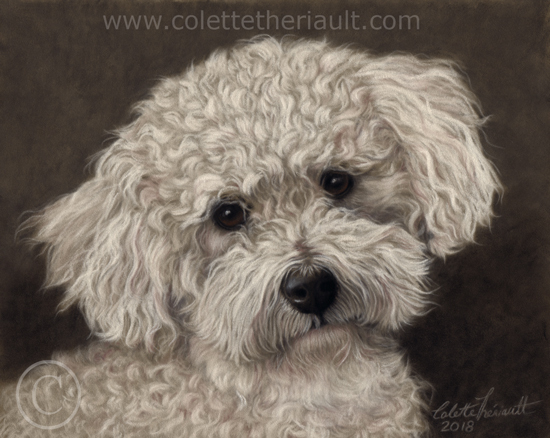 As I was working on this portrait my heart started melting as soon as I was done drawing this dog's expressive eyes. What a darling little face!! I'm so lucky to have the best job in the world!! 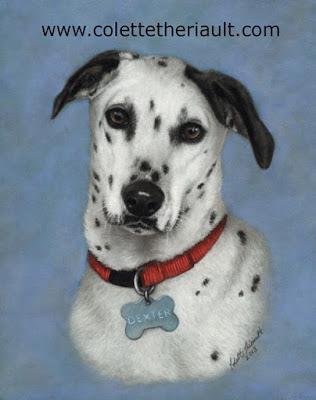 It is always my goal to achieve the most accurate likeness and expression of each and every commissioned portrait I create. 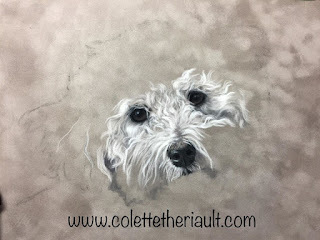 I'm very happy to say that the clients were "over the moon" when they saw the final piece... despite the fact it also brought tears to their eyes. I was told that Scooby had recently passed on the the rainbow bridge. 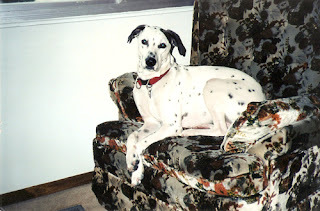 I understand fully how loosing a beloved pet is hard to take, loosing my faithful gal only a year ago today. But time heals the wounds and we learn to move on...forever left with their paws on our heart! 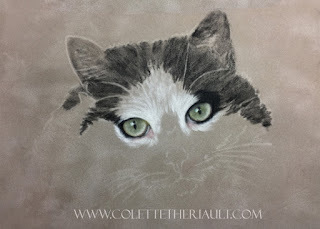 Here are a few more steps showing the progress of the soft pastel portrait, with the final image at the bottom. Been busy in the studio working on this dog painting commission of an adorable little Bichon Frise. I thought I'd share some of the work in progress pictures I took with my phone so you can see some of the steps involved. I lightly draw a pencil sketch then I always start with the eyes...yes, the eyes are the windows to the soul and I feel I need to get those just right before I can continue with the rest of the portrait. Sometimes, I go back and tweak a little but there is nothing usually major unless the client points something out. 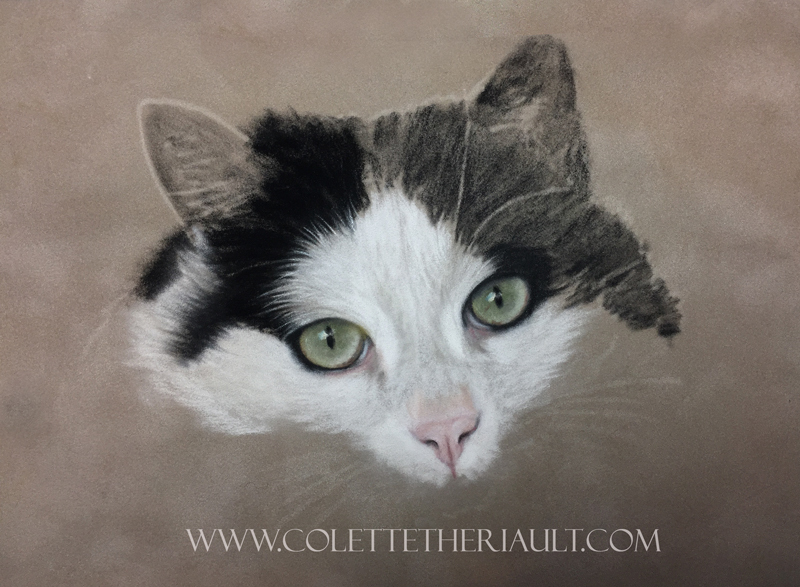 That is another reason I take progress shots of my work and send to the client. It gives the opportunity to provide feedback and if necessary, little touch ups here and there. I want every client to be totally in love with their portrait so it is important it is to their liking. 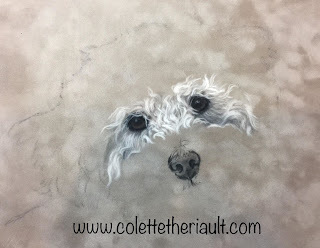 Keep watching to see the rest of the portrait as it progresses to the grand finale in my next post! I created this painting for my "Drawn to Nature" solo Exhibit at Artists on Elgin which took place the month of April 2017. On opening day, I was stoked to find out a collector had walked in first thing in the morning and purchased this pensive pose of a Canada lynx. What a wonderful surprise to wake up to! The reference image for this piece was photographed by myself, while on one of the many field excursion trips. I generally take all my own reference images because that way, I'm assured the painting or drawing I create from them will be original. 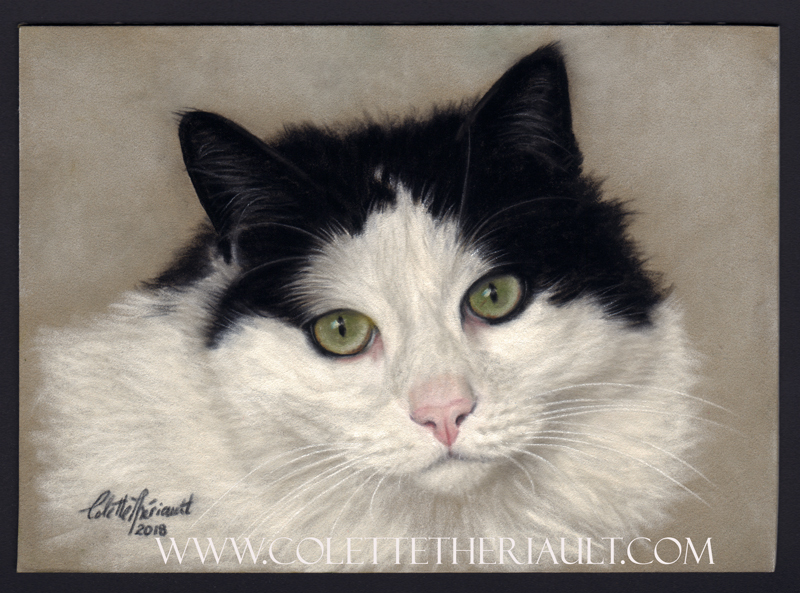 I hope you like my rendition of one of Canada's most majestic wildlife, one of two of our native wild cats. 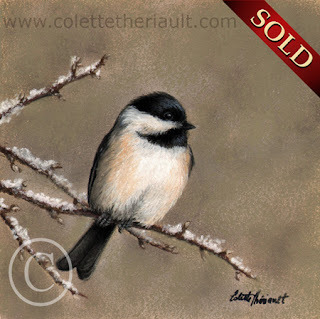 This little chickadee painting was created last year and was part of my spring solo art show "Drawn to Nature". 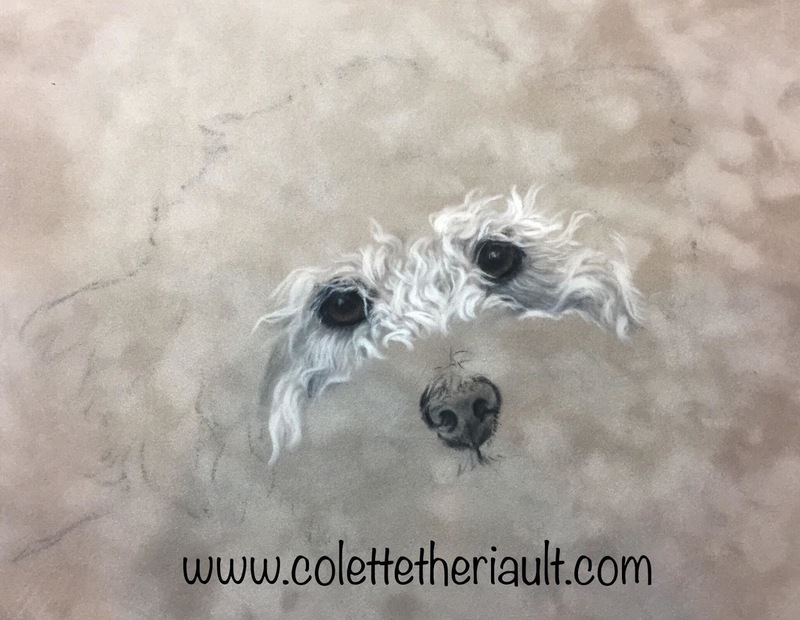 The start of the year was a very productive time in the studio as I managed to create 16 new original pieces or art specifically for the exhibit. While this one didn't immediately sell, I was thrilled when contacted recently by a collector who purchased this little treasure. I'm thinking of featuring this bird artwork on some note-cards which will be for sale in packs of four. 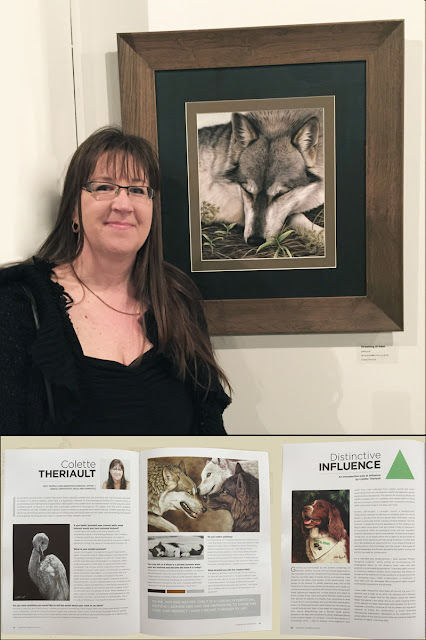 If you missed my exhibit and would like to see it on video, just hop on over to Drawn to Nature video and enjoy! Along with 25 other talented local women, I was recently featured in a book and exhibit about Sudbury women artists. Coincidentally, the opening of the exhibit and book launch took place on March 8th, International Women's Day. 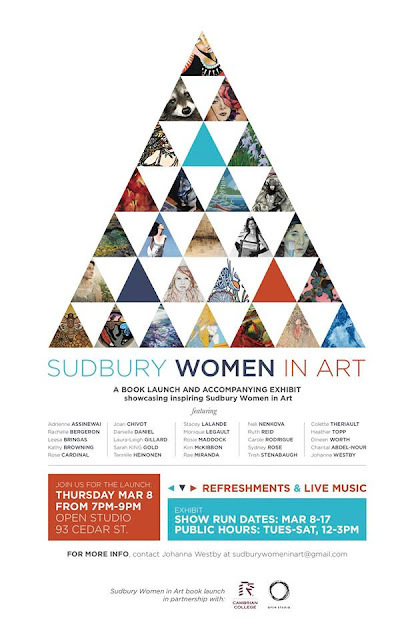 "The purpose of the book is to raise awareness of the talented and innovative women who create visual art in Sudbury. We believe in recognizing the skill and diversity in our community, and hope to encourage women who are aspiring to create. Showcasing women who have made a significant contribution in visual arts promotes equality in representation, and enhances opportunities for women as creators in the community." The event was a huge success and the hall was packed so tight people had to wait in line for up to twenty minutes just to get a peek at the display. 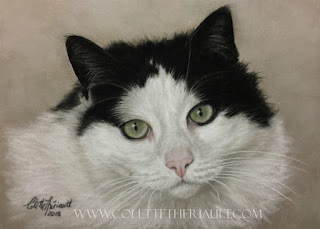 Show run dates: March 8-17th, Tue-Sat noon-3 p.m. @ Open Studio, 93 Cedar St. Sudbury. The book, created by Johanna Westby and Chantal Abdel-Nour, is a philanthropic project to benefit the community and can be purchased for 25$. Contact me for further details. 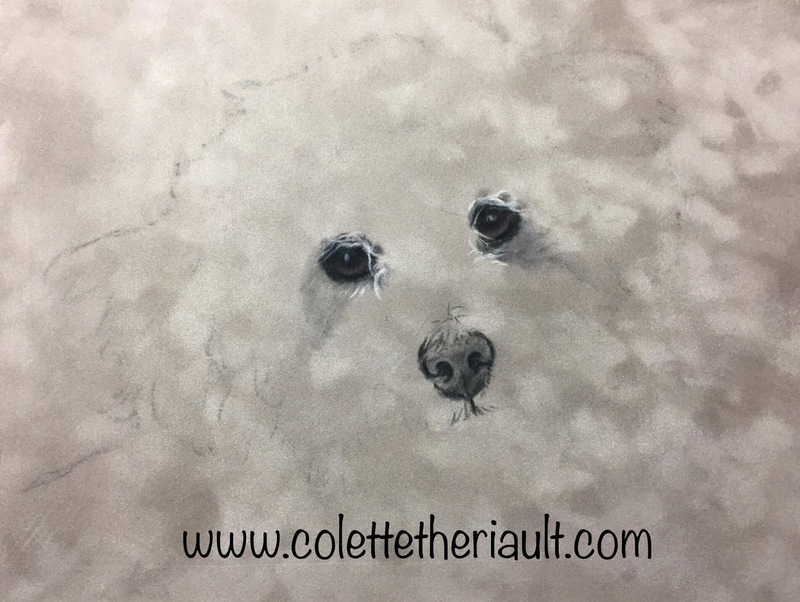 Labels: Art Show, Colette Theriault, exhibit, Sudbury Women in Arts.